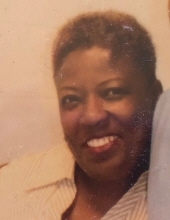 Charlotte Raiford, 56, died April 10, 2019. Charlotte Ann Raiford was born October 11, 1962 in Blytheville, AR to King Raiford and the late Sadie Lee Stewart Raiford. She was preceded in death by her sister, Linda Faye Raiford. She graduated from Melrose High School in 1980. She accepted Christ at an early age and became a member of New Hope Baptist Church in Memphis under the leadership of Reverend Slaughter. Charlotte was known to many as “Ann Raiford.” She enjoyed being around people and was always the life of the party. No matter where she was, she would always fit right on in. everyone that knew her, knew she had many talents. She could talk her way in and out of anything. Even though she didn’t have the credentials, if you needed her, she would be your lawyer, doctor, counselor, and/or psychiatrist whenever necessary. She had a big, giving heart and would do anything for anyone in need. She made her presence known with her smile, laughter, and bubbly outgoing personality. She was a longtime employee with Corky’s Barbeque on Poplar and at Paula & Raiford’s Disco. She was called home at the age of 56 to rest early on the morning of April 10, 2019. She leaves to cherish her memories: her companion, Fred Hines; her son, Jeffrey Dunigan of Memphis, TN; her daughter, Jessica Lee Ann Ponder (Kane) of Dallas, GA; her sister, Sandra L. Dickerson (Davis); two brothers, Montarris Raiford and King Antonio Raiford all of Memphis, TN; two step-sisters, Ethel M. Richardson and Clarrissa E. Richardson both of Memphis, TN; four step-brothers, Johnnie Richardson, Jr. (Margaret) of Little Rock, AR, Morris M. Richardson, Anthony M. Stepter and Damion T. Richardson all of Memphis, TN; five grandchildren, Aiden Orive, Mya L’Nes Dunigan, Malik Jeffrey Dunigan, Michael Tyrone Mull all of Memphis, TN and Isabella Tiena Ann Ponder of Dallas GA; and a host of aunts, uncles, nieces, nephews, cousins and many friends that enjoyed and love her dearly. Charlotte Ann Raiford will truly be missed. To plant a tree in memory of Charlotte Raiford, please visit our Tribute Store. "Email Address" would like to share the life celebration of Charlotte Raiford. Click on the "link" to go to share a favorite memory or leave a condolence message for the family.